HotPotatoes (HotPot) is a free software tool that allows instructors to make quizzes and other activities like crossword puzzles. For more information, and to download the program, visit the Hot Potatoes Home Page. 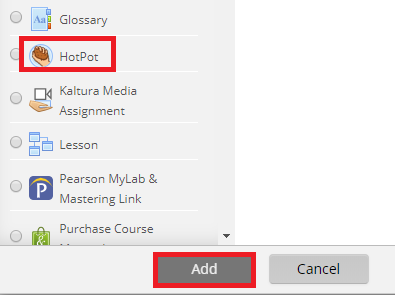 You will need to create the activity in the Hot Potatoes program and save the file before adding it to Moodle. PLEASE NOTE: This tool is for assessment only, not for evaluation. Find out why? 3. Click Add an activity or resource at the right of a content section. PLEASE NOTE: There are two different ways to complete the next step depending on which view you are in. If you see two separate drop-down boxes, click Add an activity and select HotPot. For more information about this option, view Activity Chooser Option. 4. Select HotPot from the list at the left, and click Add at the bottom. 5. 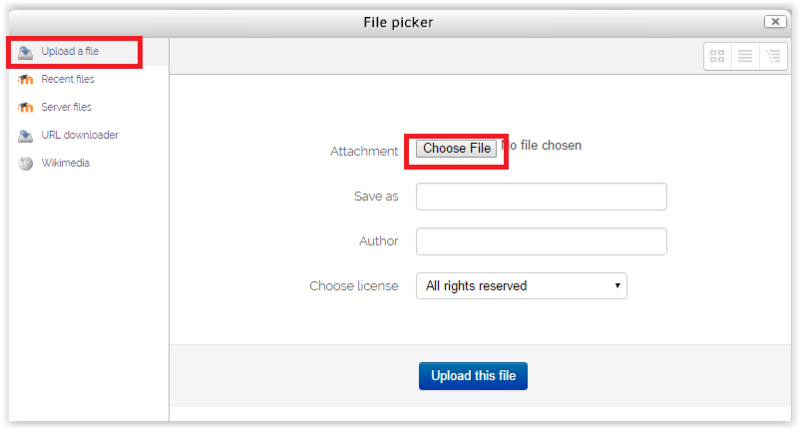 Choose a Name and click the Add a File icon next to the Source file section. 6. Open the Upload a file tab from the left side of the pop-up window. Then click Choose File... and select the desired HotPot quiz file from your computer. 7. Click the Upload this file button at the bottom.